He was born about 1820, during the height of the power of the Plains Tribes, probably along the Canadian River in the traditional winter camp grounds of his people. After developing a reputation as an outstanding warrior, he was was made a sub-chief of his tribe under Chief Dohasan while still in his twenties. In appearance, he was described as tall, having a fine physique, erect bearing, and a piercing glance. He fought with Chief Dohasan at the First Battle of Adobe Walls in 1864, and earned enduing fame for his use of an army bugle to confuse the troops in battle. 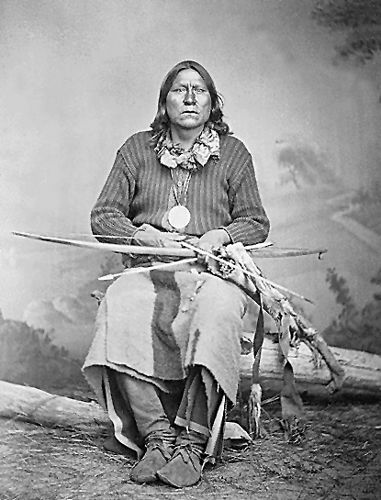 His speaking abilities gained him the title of “Orator of the Plains,” and as such, he negotiated several treaties with the American government including the Little Arkansas Treaty in 1865 and the Medicine Lodge Treaty in 1867, which required the Kiowa to be placed on a reservation. The treaty assured the Kiowa people rule over the lands set aside for them, but white settlers continued to pour across their territory and as a result the Kiowa continued to raid settlements and harass immigrants. The unstable situation got worse when Chief Dohasan died in 1866 and without his strong leadership, competition between several sub-chiefs including Satanta, Guipago, and Tene-angopte, resulted in more raids across the southern plains from Kansas to Texas, during the fall of 1866 and into 1867. During one of these raids in the Texas Panhandle, the Kiowa killed a man named James Box and captured his wife and four children, whom they sold to the army at Fort Dodge, Kansas. By this time, Satanta’s fame as a warrior and a leader was growing but he was unable to defuse a confrontation between the Kiowa and the US Cavalry near Fort Zarah, Kansas in 1867. After a young Kiowa warrior was killed at the civilian camp near the army fort, the Kiowa gathered to avenge his death and the cavalry retaliated by attacking the Kiowa encampment, in which several children were killed during the brief skirmish. The Medicine Lodge Treaty of 1867 failed to resolve the sources of conflict and by early 1868 the Kiowa and other plains tribes were actively attacking white settlers. Fearing that these attacks were leading to an Indian uprising, General Philip H. Sheridan was sent in to restore order in the “winter campaign” of 1868-69. Sheridan’s strategy of destroying Kiowa homes and horses dampened the Kiowa’s will to resist, especially after Lieutenant Colonel George A. Custer destroyed the southern Cheyenne village on the Washita River on November 23, 1868. Upon hearing of Custer’s willingness to kill women and children, Satanta and Guipago decided to surrender. Flying a flag of truce, the two chiefs approached Custer on December 17th, but were immediately arrested and held for nearly three months while Custer sought permission to hang them. Finally, in February, 1869 Tene-angopte negotiated their freedom by promising that the Kiowa would return to the reservation and cease all attacks on white settlers. However, by 1871, Satanta and his followers were obviously not satisfied with the reservation and began to make a number of attacks on wagon trains in Texas. On May 18, 1871, Satanta, along with Big Tree and Satank, led the Warren Wagon Train Raid in Texas. Also known as “The Salt Creek Massacre”, the incident occurred as Henry Warren was contracted to haul supplies to Texas forts including Fort Richardson, Fort Griffin, and Fort Concho. While the freight train was traveling down the Jacksboro-Belknap Road on May 18th towards Salt Creek Crossing, they encountered General William T. Sherman, who had earlier allowed the Satanta and his men to pass unmolested. Less than an hour later, the wagon train spotted the group of about 100 warriors. Recognizing an eminent attack, the wagon train quickly pulled into a ring formation, but the 12 teamsters were overwhelmed by the warriors. When the attack was over, the Indians captured all of the supplies and killed and mutilated seven of the wagoneer’s. Five men managed to escape and Thomas Brazeale was able to reach Fort Richardson on foot, some 20 miles away. When Colonel Ranald S. Mackenzie learned of the attack, he immediately informed General Sherman, who in turn dispatched Mackenzie to bring the offending Indians to justice. Satanta and Big Tree were tried in Texas and sentenced to death; but Texas Governor Edmund Davis, overruled the court and the punishment was changed to life imprisonment. While in prison, a visitor described him as “a tall, finely formed man, princely in carriage, on whom even the prison garb seemed elegant.” Just two years later, Satanta was released in 1873, conditional upon the good behavior of their people. The following year, Satanta and his warriors were back on the warpath, attacking buffalo hunters and engaging in the what is known as the Second Battle of Adobe Walls which occurred on June 27, 1874. 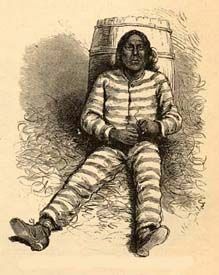 In October, 1874, Satanta was captured and once again placed in the Texas Penitentiary at Huntsville. Unwilling to spend the rest of his life in prison, Satanta committed suicide on October 11, 1878, by throwing himself from a high window of the prison hospital. Big Tree, with other chiefs believed to be secretly hostile, were confined as prisoners at Fort Sill, Oklahoma. After Big Tree’s release, he continued to live on an allotment from the reservation until his death in 1929.